Keep track of your role playing world: characters, spells, monsters, treasures, tricks, traps, etc. 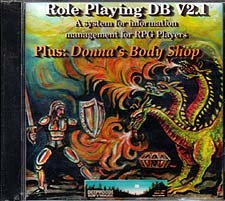 Also included - Donna's Body Shop: a collection of graphical "body parts," which can be combined to create a "self portrait" of a player's character. TIFF, GIF and JPEG format files - compatible with all graphics editors.